The Expedition Portal team is halfway through our visit to Moab and the Easter Jeep Safari. Making the most of our time with the concept and production vehicles at the event, we couldn’t pass up the chance to test the 2014 Jeep Grand Cherokee on one of the most iconic roads in the Southwest––the White Rim Trail. A narrow and serpentine loop, the 100 mile White Rim Trail is a perfect match for the Grand Cherokee and any driver needing a vehicle with refined road manners coupled to modest off-road capabilities. Our dozen hours behind the wheel yesterday provided great insight into Jeep’s flagship luxury cruiser. The most talked-about attribute of the 2014 Grand Cherokee is the optional 3.0-liter turbo-diesel V-6 engine. Made by VM Motori Cento in Ferrara, Italy, the EcoDiesel is already proving to be a high-demand item as packaged in the new 2014 Ram 1500 pickup. In the Grand Cherokee, the EcoDiesel provides ample power, torque, and the fuel efficiency digits push as high 30 mpg. With a range of more than 700 miles, it’s an impressive travel-wagon. 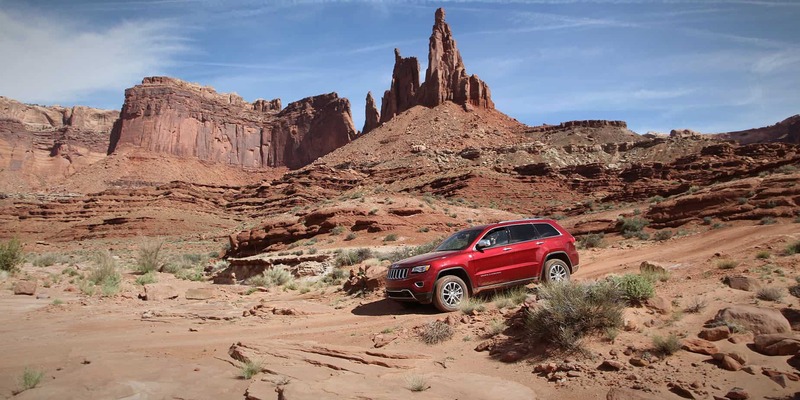 Driving to the start of the White Rim Trail, there’s no doubt the Grand Cherokee is designed to seduce the luxury-set. 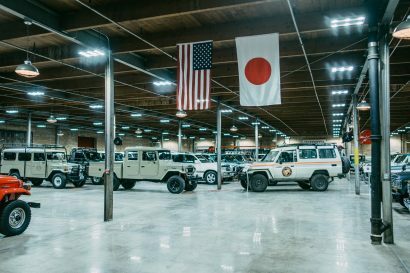 The finely appointed interior is festooned with creature comforts including a heated steering wheel, large navigation and entertainment system, and frankly more buttons than I could inventory during the short 30 minute drive to the start of the dirt. The seats rival anything from the pinnacle luxury brands making an all day drive something I fully intend to test in the future. Just as I settled into the Grand Cherokee, the road beneath me started to gently rumble, a cue our trip had transitioned to dirt. Given how poised the Grand Cherokee is on the tarmac, it seemed implausible it would handle the dirt without serious compromise, but I am quite used to being proven wrong. With three available ride heights assisting the Quadra-Trac 4WD system, the lower two suspension settings proved to be the most comfortable on the bumpy slickrock sections of the trail. The taller setting did give the Grand Cherokee a proper stance, one capable of clearing rather sizable trail obstacles, but it also gave the vehicle a rough, almost jarring ride quality. When employed only to navigate through the more imposing obstacles, the tallest ride setting was nice to have. With the tires aired down to attenuate the ride and improve traction, the Grand Cherokee not only never slipped a wheel, it provided a smooth ride for driver and occupants. When the going got steep and loose, the traction control jumped in to manage wheel slip, which was effectively nonexistent. After nearly 12 hours on the trail, we all agreed the Grand Cherokee is a comfortable vehicle, one rivaling the likes of the Land Rover LR4, Toyota 200 Series Land Cruiser, and other upper echelon SUVs. While it is impressivey capable off-road, it isn’t going to supplant the LR4 or other luxury SUVs as a premium off-road platform. The approach angle is reduced by the low overhang of the front fascia, and the suspension travel is simply too constrained to really be a go-anywhere overlander. 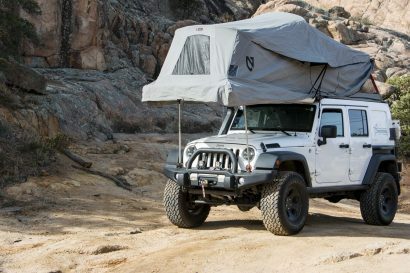 The final impressions as we rolled back into Moab left us with the feeling Jeep nailed their design objectives, even if the platform doesn’t quite hit center with the traditional overlanding crowd. The Grand Cherokee is first and foremost a pavement-biased SUV. It feels most at home spooling up to speed and dispatching miles of pavement. The EcoDiesel engine is quiet, torquey, and adds considerably to the vehicle’s overall character. On the trail, the Grand Cherokee certainly doesn’t shy away from technical terrain but, it’s just not as much at home in the dirt.